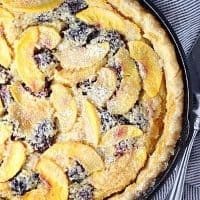 BLACKBERRY PEACH BUTTERMILK PIE — Fresh blackberries and peaches add a fruity twist to this classic buttermilk pie. Peach and blackberry is one of my favorite fruity combinations. And of course I love pie! 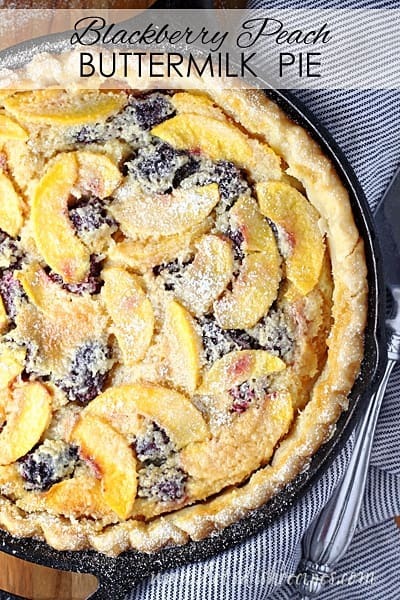 Which made this Blackberry Peach Buttermilk Pie a match made in dessert heaven! I confess, I’d never had a buttermilk pie before, and this fruit filled version was a wonderful introduction. But my kids kept saying how good the filling was, and asking me to make a version without fruit. So I guess a classic Southern buttermilk pie is next on my “to do” list! And there’s still time to get in-season blackberries and peaches, which makes this pie eve more wonderful than it already is. I’m already dreaming of other versions made with different fruit–like blueberries. I love the way this pie bakes up using a cast iron skillet, but you could certainly use a regular pie pan if that’s what you have. And I’m all for using the prepared pie crust to save time, but a homemade crust would definitely put this dessert over the top. Just note that the recipe requires a double-thick pie crust to hold all that filling, so if you make your own, roll it out a little thicker than normal. 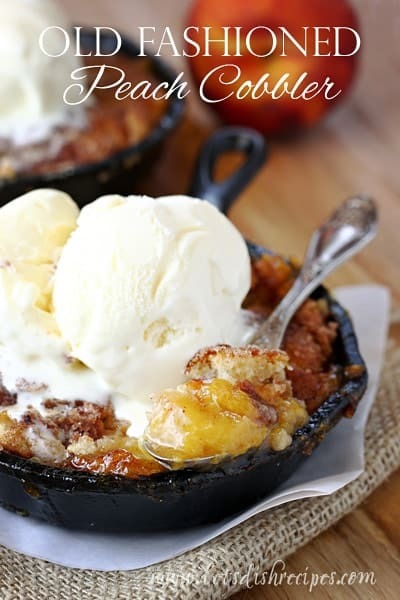 We served ours with a dusting of powdered sugar, but some whipped cream or vanilla ice cream would also be wonderful. One thing is for certain, this pie is a new favorite at my house. It disappeared within 24 hours and I’m already getting requests to make it again! 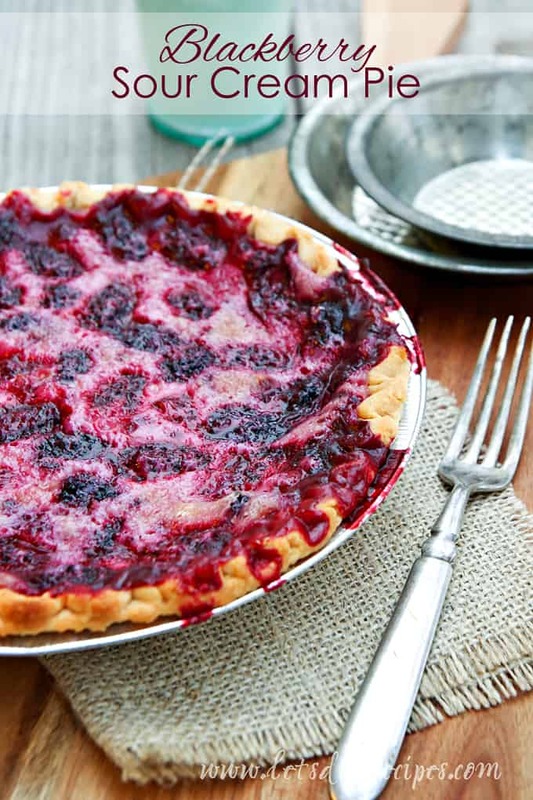 Be sure to save this Blackberry Peach Buttermilk Pie recipe to your favorite Pinterest board for later. 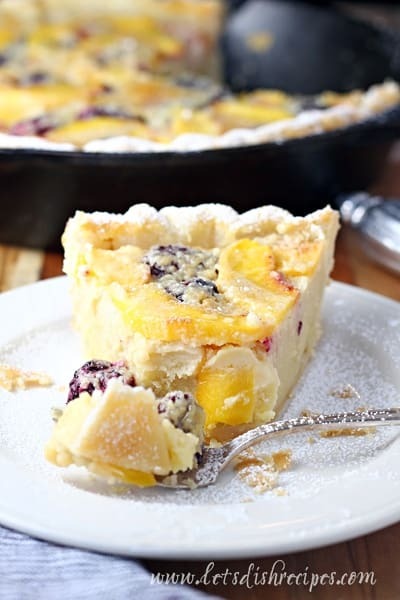 Fresh blackberries and peaches add a fruity twist to this classic buttermilk pie. Preheat oven to 350. Lightly grease a 10-inch skillet or pie pan. Let pie dough stand at room temperature for 10 minutes. On a lightly floured surface, roll one pie crust into a 14 inch circle. Repeat with second pie crust. Brush one pie crust with water and lightly brush with water. Place the second crust on top. Transfer to prepared pan, pressing into bottom and up the sides. Crimp edges as desired. Layer blackberries in prepared crust. Arrange peaches over blackberries. Place the pie on a rimmed baking sheet. In a medium bowl, whisk together sugar, flour and salt. Mix in buttermilk, eggs and vanilla. Stir in melted butter. Carefully pour over fruit. Bake for 55-65 minutes, or until center is golden brown and set. Cool completely on a wire rack before slicing and serving.